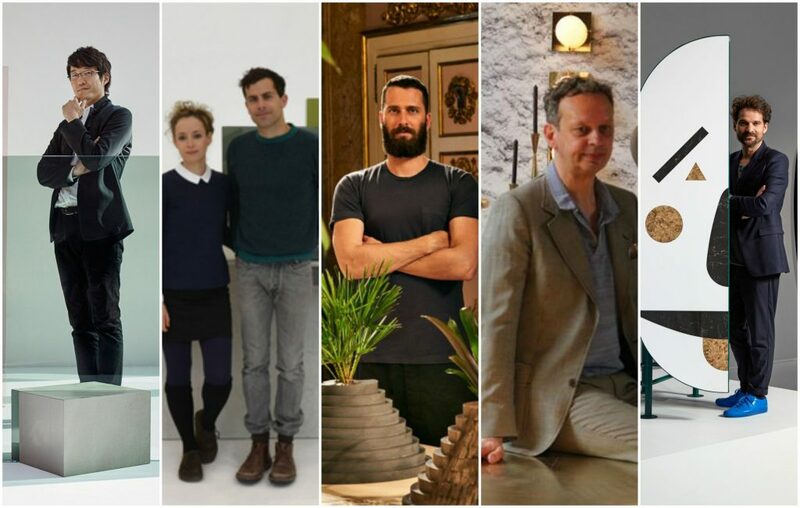 From left: Oki Sato of nendo, Yael and Shay of Raw Edges, Philippe Malouin, Tom Dixon, Jaime Hayon. In 2013 we welcomed the ‘stone garden’ installation by japanese studio nendo. 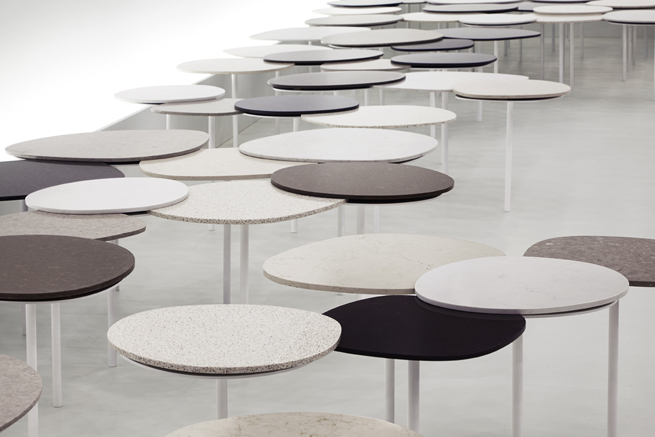 Conceived as clusters of one-legged tables overlapping in order to support each other. 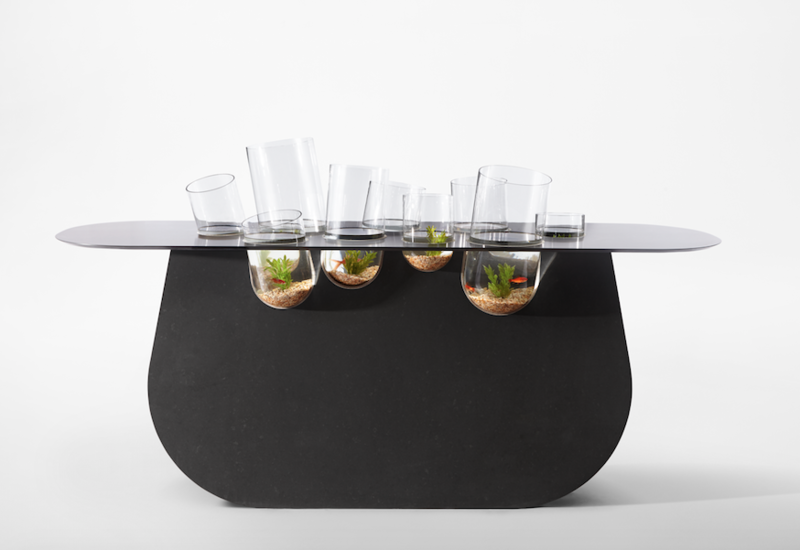 Produced in collaboration with Caeserstone, the pieces were held in place without using any nails or screws to secure them, and employed a modular system, allowing for the option to change the depth and direction of their placement, forming to freely fit within the environment – just like how an amoeba adapts to its surroundings. 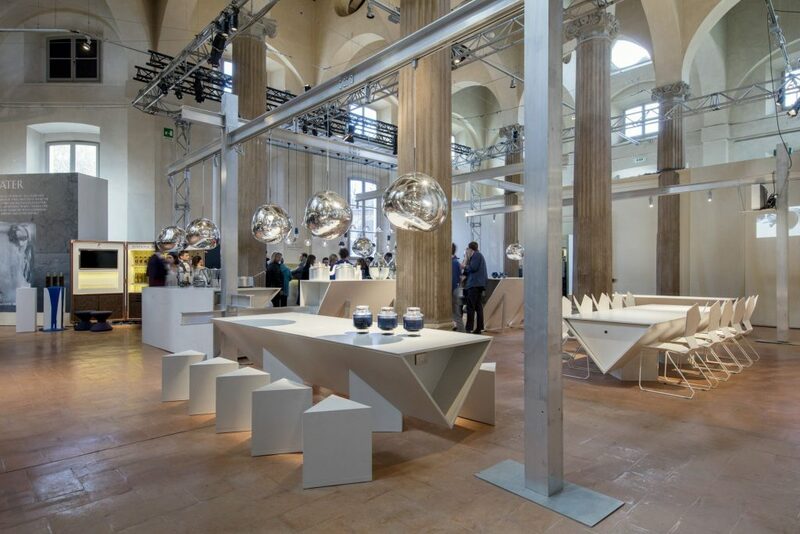 Since the tables are stabilized by the weight of other ones, Caesarstone was implemented for their surfaces, creating a new kind of ground surface seeming to float like a garden in the universe. 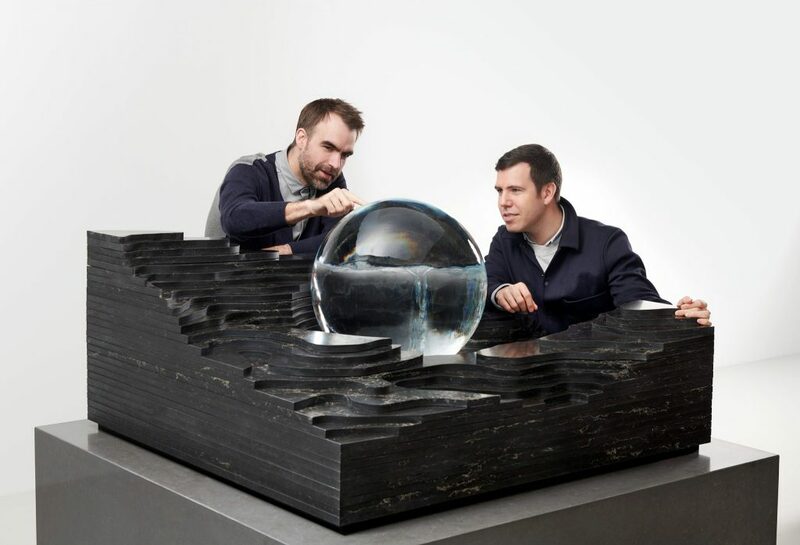 London-based studio Raw Edges reconsidered the Caesarstone ‘surface’ in 2014 in the context of the home. 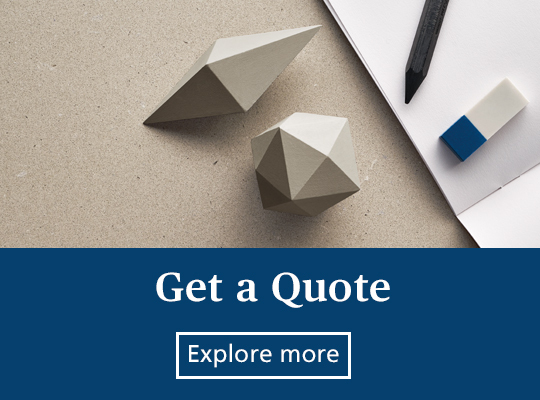 The result was ‘islands’ a series of modular pieces that utilized Caesarstone to create three-dimensional structures — a display of cabinetry, appliances or separate containers — that express the versatility of the material. 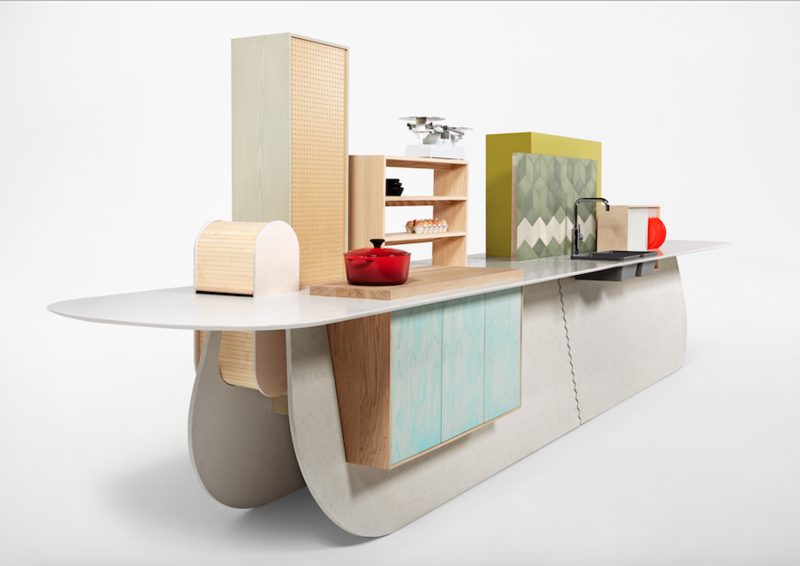 The components designed by raw edges address a number of zones found in one’s dwelling: kitchens, bathrooms, spaces whose surfaces answer to more emotional needs such as play, and can be slotted together, rather than simply being placed on top or around one another, to form numerous arrangements that address working, storage and general living. 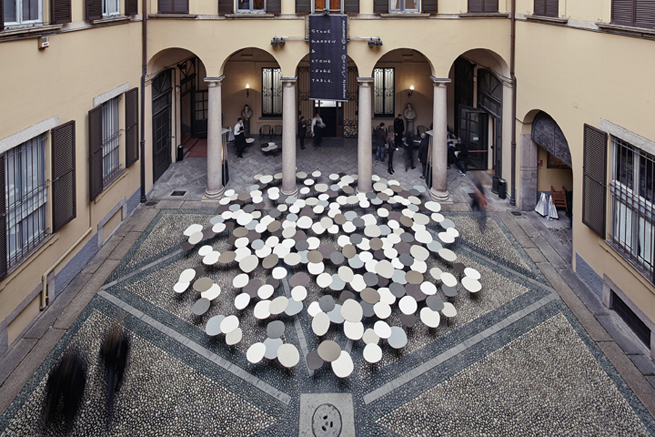 Moving into 2015, Caesarstone presented ‘movements’ conceived by Philippe Malouin — an interactive installation that combines an eight-piece swing-set and a collection of handmade planters. 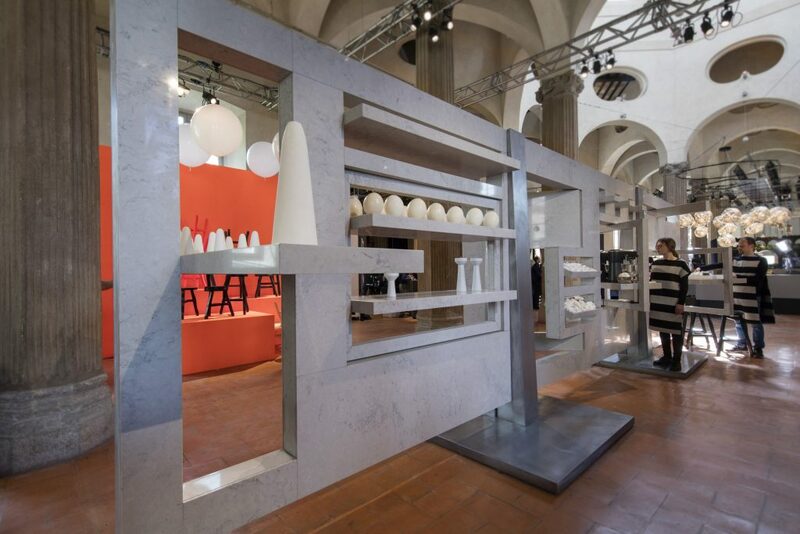 Positioned within the historic palazzo serbelloni, ‘movements’ is divided into two parts, each of which explores the unexpected application of the Caesarstone material, and its distinctive textures, in process-based design. 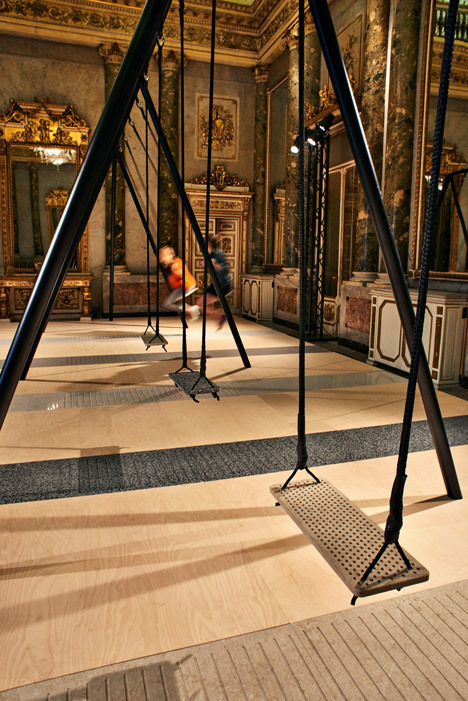 The swings, typically associated with carefree, childish activity, are removed from their original playground surroundings into the historical setting, bringing an out-of-context element into play, inviting visitors to interact with the work. 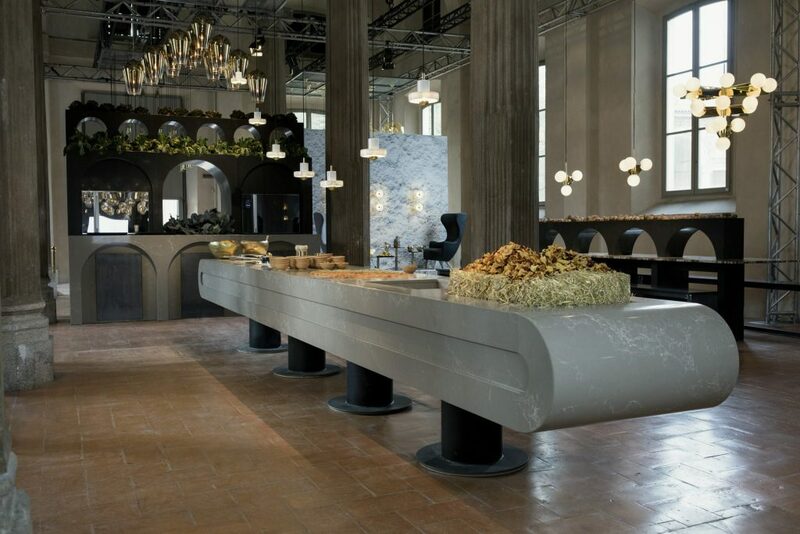 British designer Tom Dixon created a series of experimental kitchens using Caesarstone inside a deconsecrated 17th century church in Milan. The Restaurant installation consisted of four Tom Dixon-designed kitchens and dining areas, decorated with a range of the designer’s new and old products. Food by Italian studio Arabeschi di Latte was prepared in three of the kitchens and whisky was offered from the other, while demonstrations showing cutting-edge cooking techniques and food preservation methods were incorporated into the show. 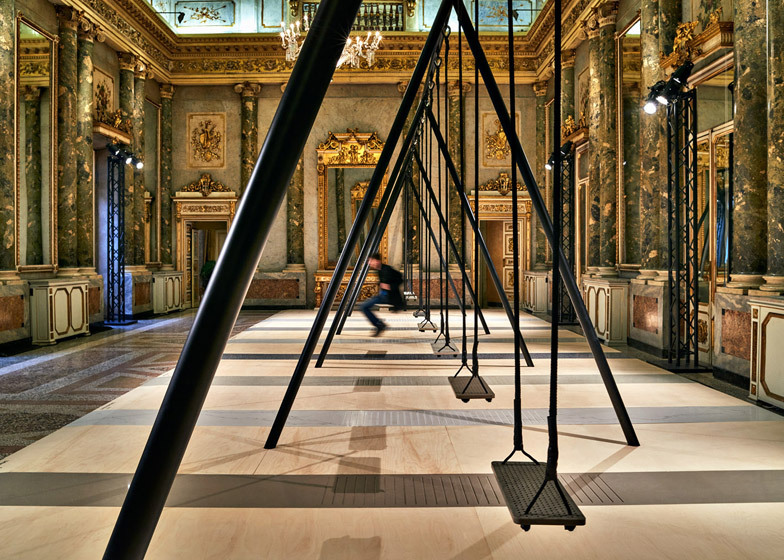 Stone Age Folk, by designer Jaime Hayon, built on a fantastical world, exhibited within the historical backdrop of the Palazzo Serbelloni. The installation draws on inspiration from flora, fauna and folklore from different cultures. 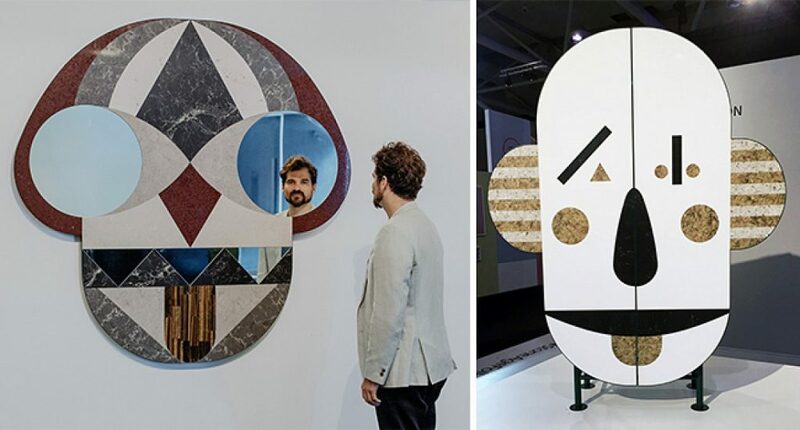 Tribal masks and Hayon’s signature clown faces are featured on the large-scale wall panels of the pavilion and presented alongside playful carousels made of Caesarstone, furniture pieces and light fixtures. 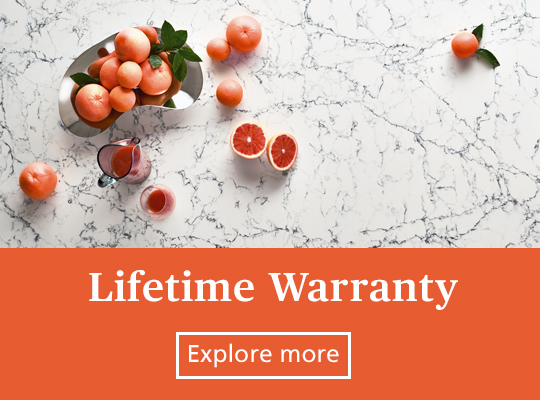 Further demonstrating the versatility of Caesarstone’s material, through the lively, visionary eyes of the designer, dining tables, small coffee tables and cabinets become bird-like characters and animated faces. 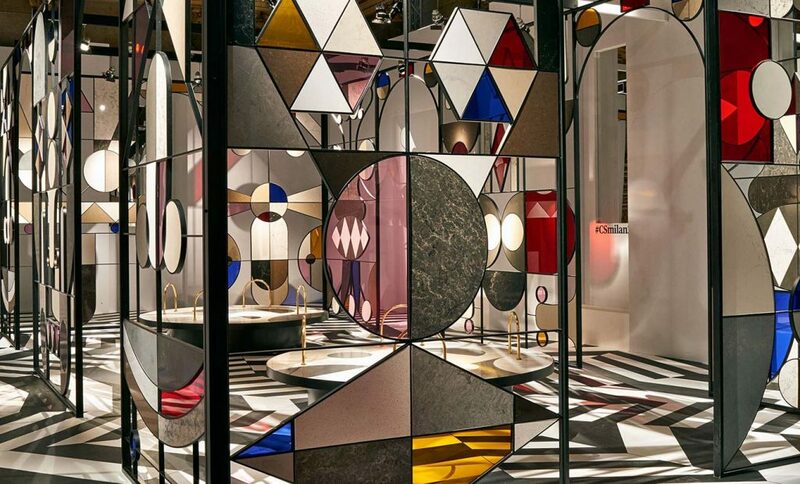 Together, all the pieces contribute to the kaleidoscopic feel of the installation and enable the visitor to playfully interact with the material in a fresh, unexpected way. Centered around today’s kitchen must-have, Snarkitecture have created four, highly conceptual takes on the kitchen island. 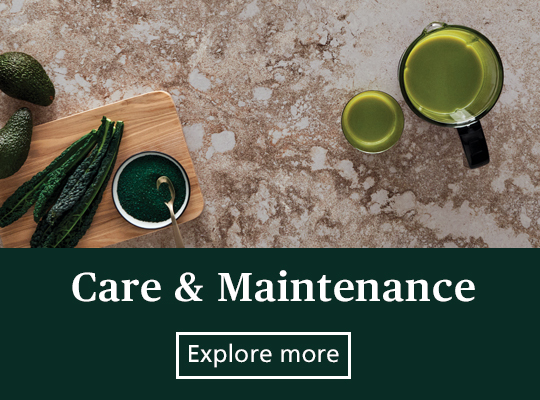 Using Caesarstone’s surfaces as the golden thread, each one utilizes a different Caesarstone colour. 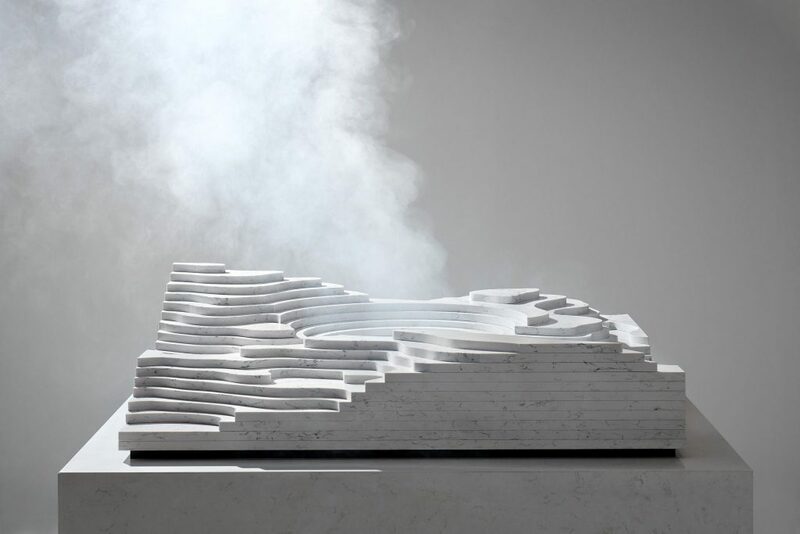 Crafted with reference to water in various states, the islands take form with stratified layers that resemble natural topography. Each one will be exhibited and explored in Milan as part of Fuorisalone, in large-scale in April 2018.